Personalised luggage strap embroidered with name or text of your choice in two places. Personalised luggage strap embroidered with name or text of your choice in two places. Help to identify your luggage whilst travelling with this colourful striped black sturdy luggage strap. 2.2m suitcase strap in chunky nylon with sturdy buckle and adjuster, adjustable down to 1.2 metres in length. Personalised luggage strap embroidered with name or text of your choice in two places. 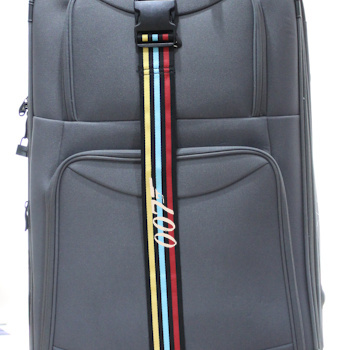 Help to identify your luggage whilst travelling with this colourful striped black sturdy luggage strap. 2.2m suitcase strap in chunky nylon with sturdy buckle and adjuster, adjustable down to 1.2 metres in length. Security combination lock. Striped sturdy strap 5cm width, woven material.